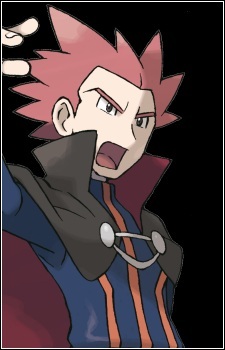 Red spiked hair wearing a black battle suit with red and black cape he is thought to be one of the most powerful Pokemon trainers in the world. His specialty is dragons and those who challenge him are unlikely to succeed, his favorite Pokemon is Dragonite which has little experience in losing a battle. Challenging him is futile!